We took a drive up to Julian today- the second part of my birthday surprise. Julian is a mountain community about an hour outside of San Diego. The trees are all golden this time if year and the air is crisp. It's the best place to go for apple pie, and in our case, for calamari steak and someday-home dreaming. 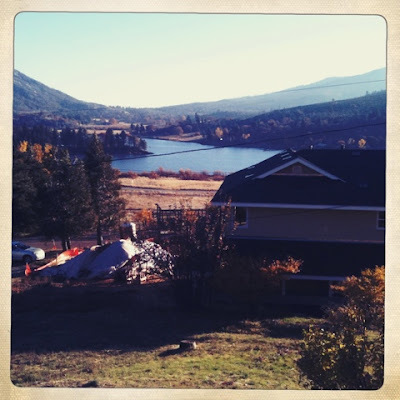 Rodney found a property for sale there with an incredible view of Lake Cuyamaca. It's a bit of a fixer-upper, but it has potential. I might consider trading in my beach and bay for a lake and four seasons. That is if I could work from home as an artist and teach creativity workshops to the locals. :) Could we leave city life for a peaceful mountain dwelling? It may not be a possibility now, but I adore my husband for helping me paint a picture in my mind of the life that is ours to create.